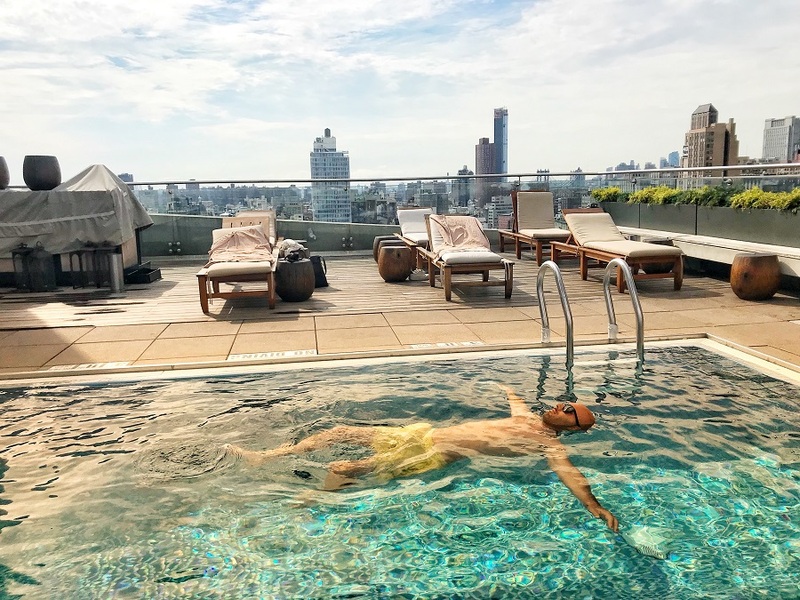 The James New York – SoHo has one of the best and most luxurious rooftop pools on Manhattan. 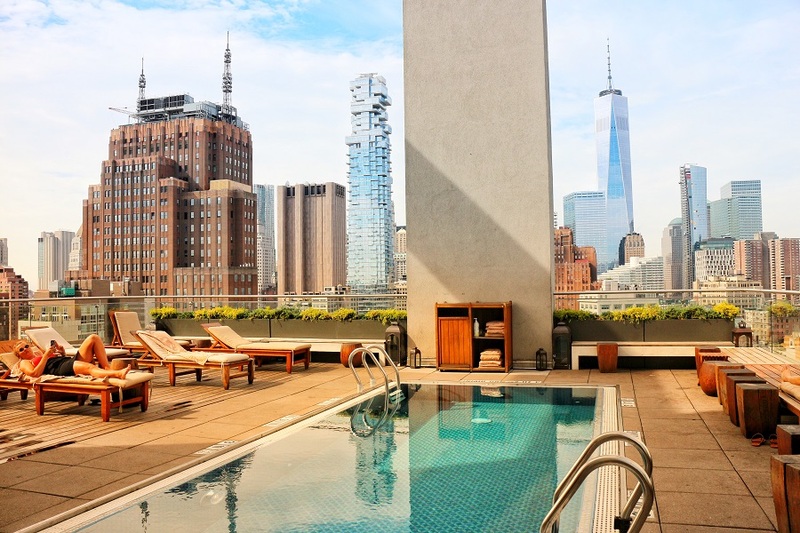 The rooftop pool is located on top of the popular hotel The James New York – SoHo. During daytime the guests of the hotel can swim in the pool and later in the afternoon and evening the terrace turns in to a rooftop bar, where a trendy and a tad younger crowd gather to sip on cocktails and party with a view. We decided to spend a couple of hours here on a Friday from 10:00 AM. 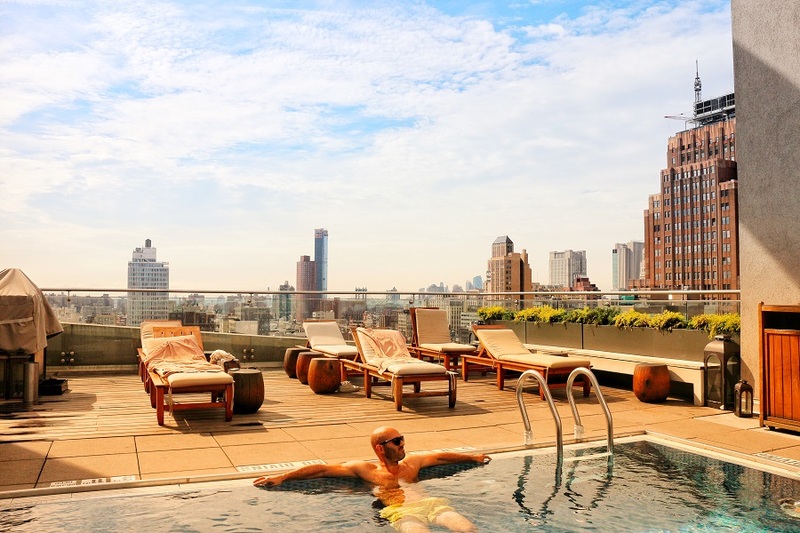 The main thing on this terrace – the rooftop swimming pool. The pool is actually quite small for being a hotel swimming pool, but we were lucky to have the whole terrace for ourselves for 3 hours. During the earlier hours of the day roof terraces are often free of people and if your lucky you have the luxury of having the whole terrace for yourself. A nice insider tip from us. It happens to us all the time. The pool is not heated, but it didn’t bother us as the outside temperature was around 27 degrees (81 Fahrenheit). 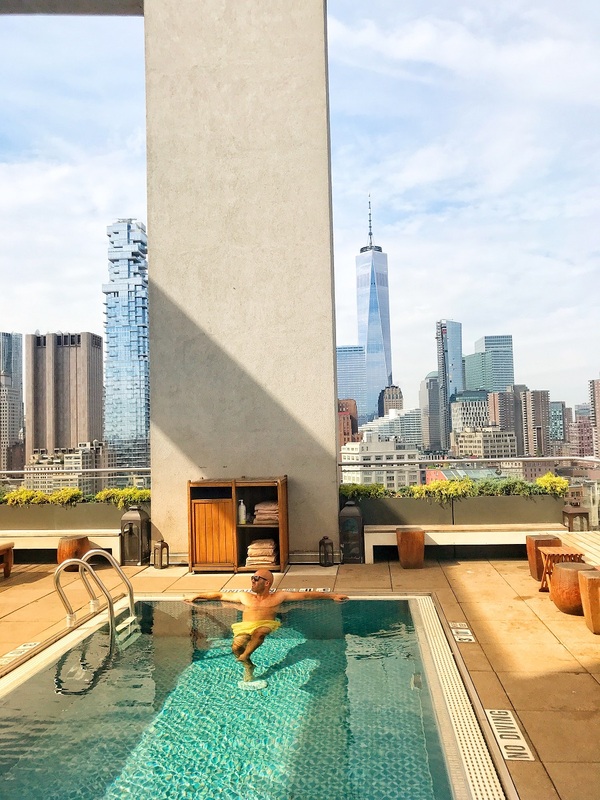 When lying in the pool you’ll get a nice view over the Hudson River in one direction and The One World Trade Center and Wall Street to the south. Super cool and one of the best spots to see this iconic skyline from. The terrace is equipped with lots of sun loungers for the guests to relax in. I can’t figure any better place to get some sun rays on Manhattan then at Jimmy at the James. You’ll get a towel when entering the rooftop and theirs always a lifeguard up here keeping all the swimmers safe. 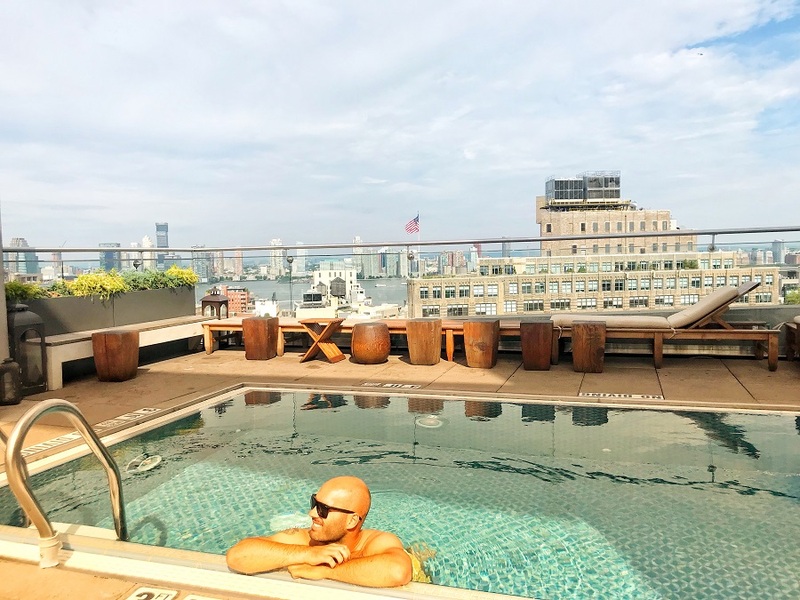 If your looking for one of the best NYC rooftop pools, you’ve come to the right place if you book your stay at The James Hotel New York. This place has our full recommendation. 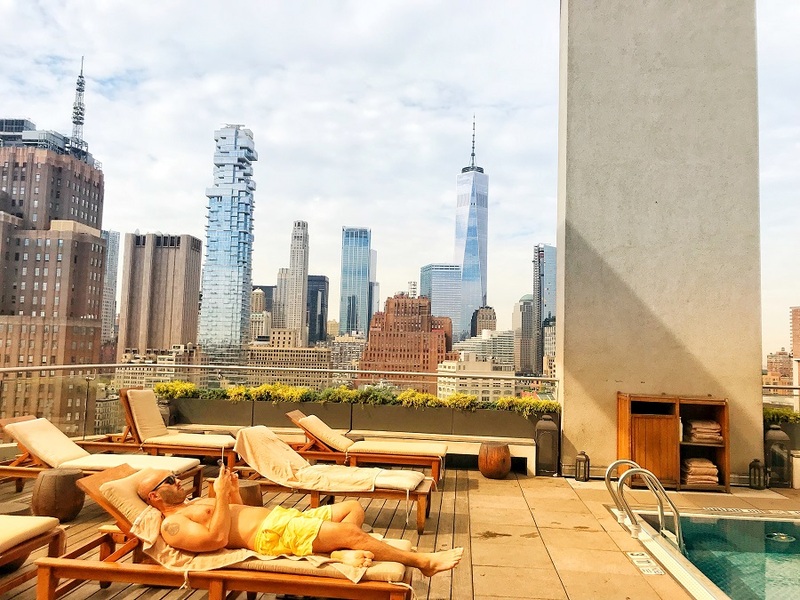 The luxury to mix a big city weekend with some sun and swimming has never been easier on Manhattan.